The goal has certainly been reached, and the Escape has long been one of the best-selling sport utility vehicles in its segment. If the Ford Escape has been so successful, it is because it offers an impressive selection of engines that few competitors can match. It comes standard with a four-cylinder entry-level powertrain that features 168 horsepower and 170 lb.-ft. of torque, which makes this engine more powerful than many standard engines available in other compact SUVs. 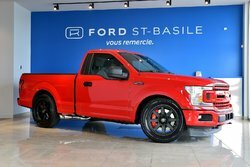 That said, consumers can also opt for a four-cylinder, 1.5-liter EcoBoost that offers 179 horsepower and 177 lb.-ft. of torque and that has a fuel consumption rating of just 9.1 liters per 100 kilometers. But that's not all. 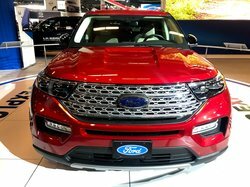 The 2017 Ford Escape is also available with a 2.0-liter turbocharged four-cylinder engine developing 245 horsepower and 275 lb.-ft. of torque. That’s a lot of power, much more than the majority of compact SUVs and their most powerful versions. Despite this impressive power, however, this engine has an average fuel consumption rating of just 9.4 liters per 100 kilometers! Finally, the towing capacity of the new Escape reaches 1,587 kilograms, one of the best towing capacities of the segment. 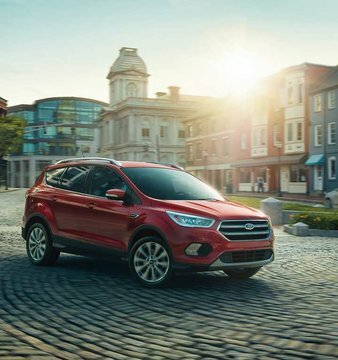 The 2017 Ford Escape offers more than a large choice of engine. It also offers several well-equipped versions, including the entry-level model offered under $25,000. 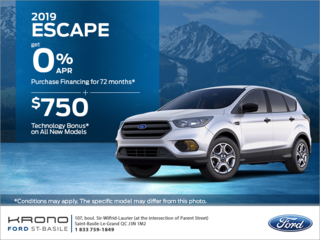 Depending on the model, the buyer of a 2017 Ford Escape receives heated seats, a sunroof, satellite radio, a set of driver assistance features, dual zone air conditioning, leather seats, navigation system and the new Sync3 multimedia system. Inside, the owner benefits from plenty of storage and cargo space, including a trunk with a capacity of 964 liters with all seats in place. Come and discover the new 2017 Ford Escape today at Ford St-Basile!